If you look at the book cover of Rachel Joyce’s first novel, you may be expecting a happy, quirky, light read. While a very good read, this is not a light or happy book. 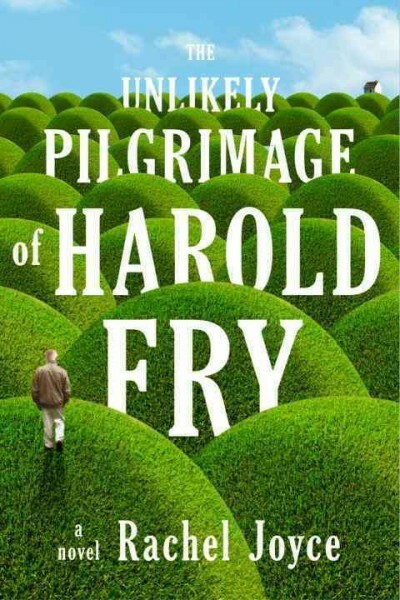 It’s about a journey taken by Harold Fry, whose life is rather empty. His wife Maureen cleans obsessively; Harold does yard work. He gets a letter from former coworker and friend Queenie Hennessey with news that she is very ill with cancer. Harold writes a brief note and goes to post it, but is troubled that a note is inadequate. Harold was a brewery sales representative who traveled with bookkeeper Queenie to visit pubs. So he keeps walking while he thinks about it. A talk with a young woman at a gas station’s convenience store inspires him to keep walking, the whole length of England, to visit Queenie. His wife Maureen is flabbergasted, and can’t decide if she’s more angry, worried about him, or lonely. Harold is not much of a walker, and gets lots of blisters. He sends postcards to Maureen and Queenie, and buys souvenirs for them along the way. His wife is concerned that he will empty their retirement savings account on such a long journey, so Harold starts camping instead of staying in hotels. Harold is very shy, and has always felt akward because he’s tall, but people like to tell him their stories. His walk to save Queenie inspires some fans and even gets some publicity, leading to some funny parts of the story. Harold’s long pilgrimage gives him lots of time to think, and to reflect on his life. The journey eventually answers some questions for the reader. Why did Maureen move into the spare room, yet they stay married? Why does their bright, troubled son David never come to visit? Why did Queenie leave the brewery, and why doesn’t Harold drink? Will Harold’s walk for Queenie make a difference? And, finally, will Harold be able to finish his pilgrimage? A memorable journey for Harold and the reader.